Weatherwise, it has been lousy around here during the six weeks since I planted my vegetables. Wet, cool, and not much Sun sums it up, but it looks like summer finally showed up yesterday. Early on, I lost one tomato plant and a bunch of pepper plants. The tomato plant just never took to its transplanting, while the pepper plants suffered from an attack of snails and slugs. The surviving tomato plants did ok until this week when I noticed signs of blight. The pepper plants have just been slow to grow. 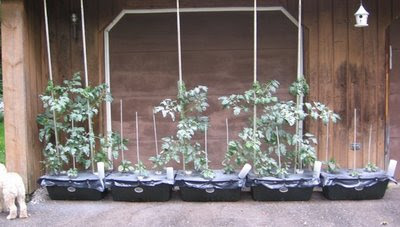 The plants look pale in the photo because the day before, I sprayed them to counter the blight. The dog (Pumpkin Pie) is looking around the corner for her nemesis du jour: Chip or Dale.